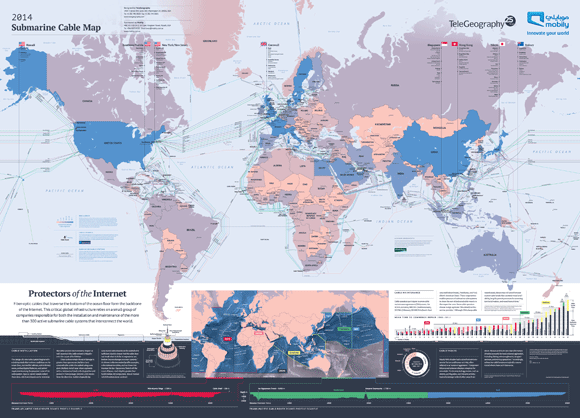 Have you gotten your 2018 submarine cable map yet? 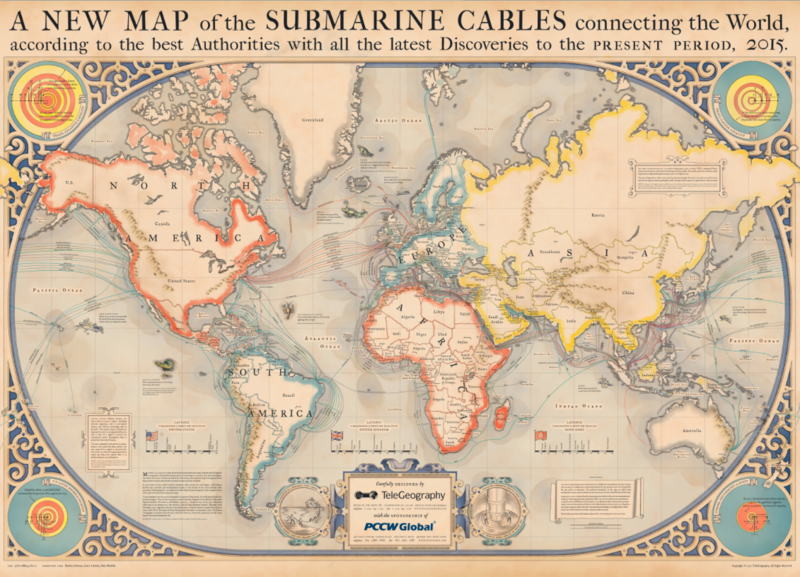 If so, you might have noticed that we're tracking a whopping 366 submarine cable systems this time around. There's been lots of conversation about the recent boom in submarine cable construction. This flurry of activity becomes clearer when our annual map is viewed over time. Today we're putting five years' worth of maps back-to-back to visualize an evolving undersea network. (And to reminisce about some of our favorite designs, if I'm being honest.) Give each map a click for a larger interactive view. 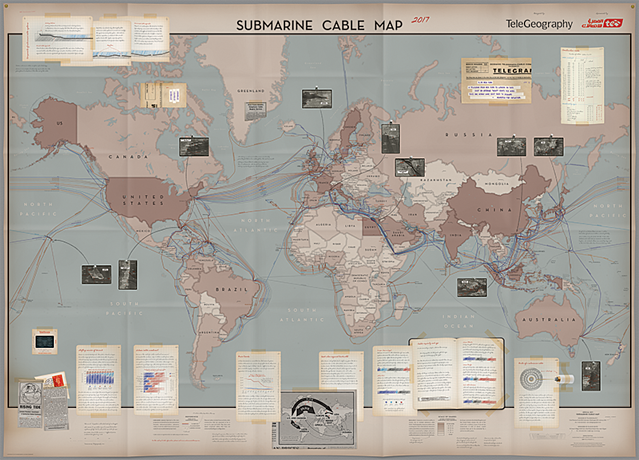 Five years ago our map detailed 232 lit cables and 12 that were anticipated to come online before 2014. 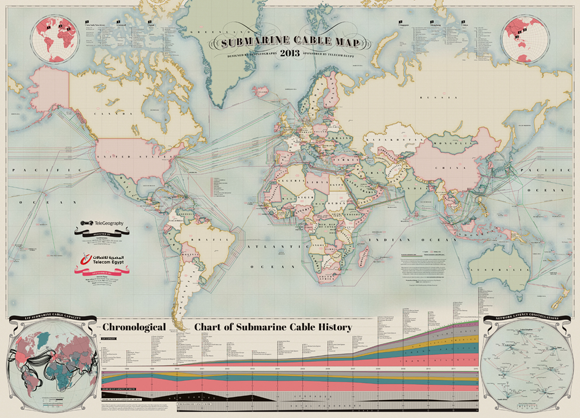 The final design charted submarine cable history, chronicling network latency and submarine cable capacity. 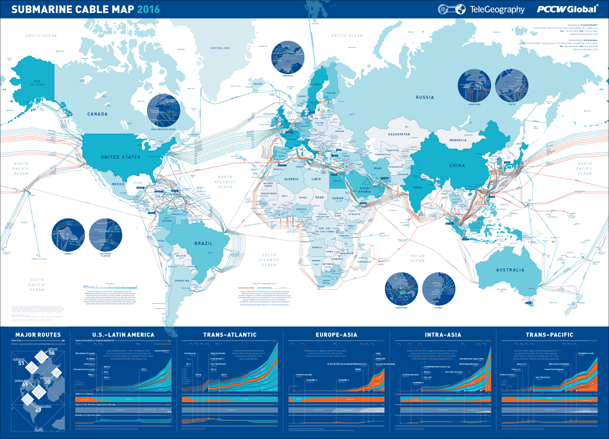 In 2014 we depicted 285 cable systems that were currently active or due to enter service by 2015, as well as the location of 44 cable laying vessels. The "Protectors of the Internet" theme incorporated coverage of the companies that actually lay and maintain cables, with detailed information on cable faults and repairs, including the number of breaks and mean time to commence repair by country. We wouldn't blame you if you wanted to play the Indiana Jones theme in the background while you gaze at our 2017 map. This edition borrowed design ideas from your favorite fictional archaeologist, including submarine cable facts as a collection of artifacts, journal entries, and hand-drawn sketches befitting of Indiana Jones. This adventurer edition is also available for purchase here. 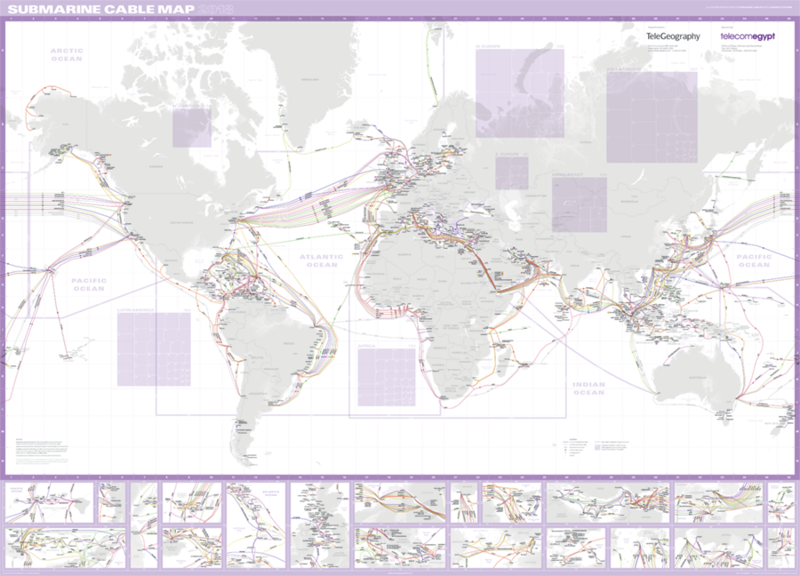 Our latest and greatest submarine cable map tracks 366 submarine cable systems and 1,006 landing stations that are currently active, under construction, or expected to be fully-funded by the end of 2020. This purple projection has more detail than any map we've ever constructed before, charting fiber pairs, resiliency, and much more. Get 'em while they're hot. Like the look of these maps? Order a flat-version of our 2018 Submarine Cable Map now through May 1, 2018 and get a free Global Internet Map with your purchase. Click here to learn more.